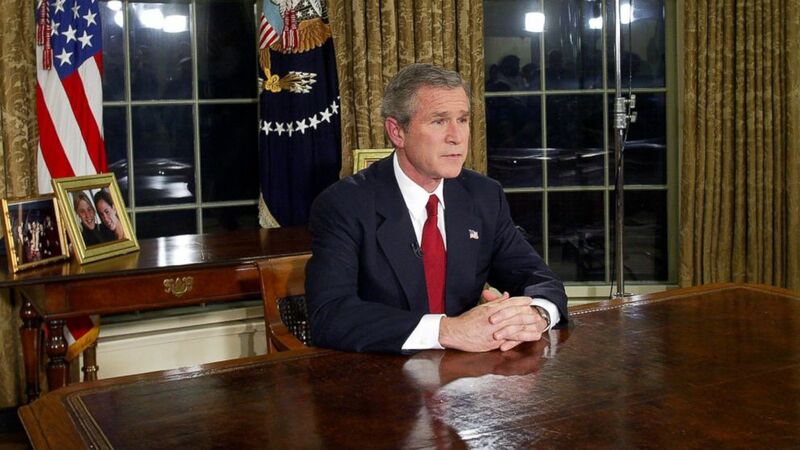 Then President George W. Bush addresses the nation, March 19, 2003, in the Oval Office of the White House in Washington. Today is the twelfth anniversary of Shock and Awe, the inexplicable attack that in one move, toppled Saddam Hussein’s statue from its pedestal in Baghdad, and toppled the United States from its position of strength and leadership in the world. 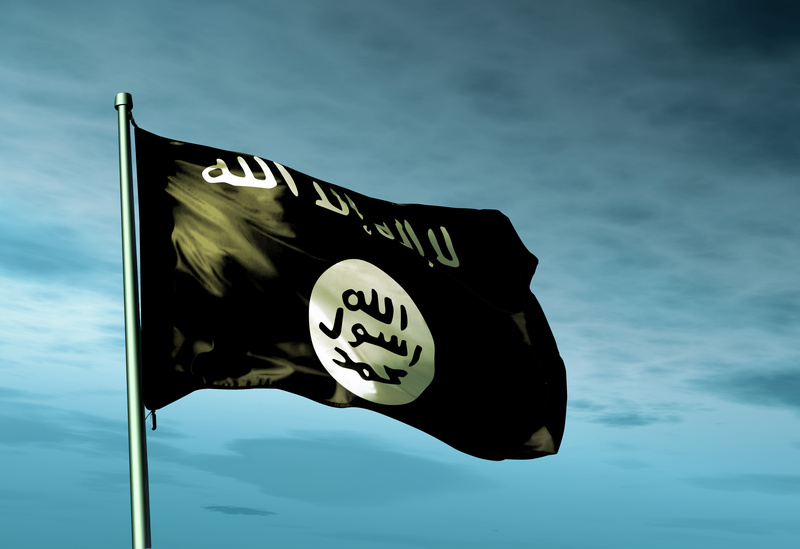 Twelve short years later, the regional war the United States ignited has become a world war. Twelve short years later, the United States’ ability to affect the war’s outcome is negligible. In fact, we have no conception of what outcome we would prefer. Suppose Iran had detonated an atomic device over Israel on March 19, 2003. It is a question that comes to mind in this season of nuclear talks. Can anyone imagine that the outcome of a catastrophe like that would be worse than the one we have witnessed since we decided we would like to turn Iraq into a western style democracy? I can’t. We have an acute fear of atomic weapons, a fear that makes us forget what conventional wars can do. Similarly, we think international wars most deadly, forgetting that civil wars are just as nasty, if not more so because the dealers of death live so near each other. The pope says from Rome that we find ourselves in the middle of a world war. Civil and regional conflicts have begun to coalesce. Armed conflict appears from Algeria and Mali in the west, to Pakistan in the east; and from Ukraine and Russia in the north, to Yemen in the south. Check Google Earth and you will see that is a lot of territory. At no time since World War II have more people been affected by war. 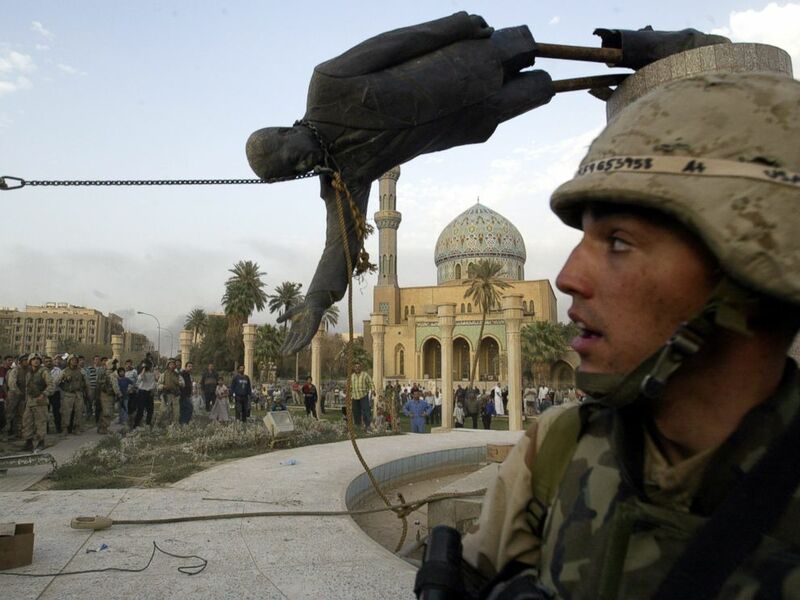 Iraqi civilians and U. S. soldiers pull down a statue of Saddam Hussein in downtown Baghdad, April 9, 2003. Two rather ominous things about this war stand out. One is that the United States has no allies in this fight. It cooperates more closely with Iran, its sworn enemy, than it does with Israel, its nominal friend. Do you think Benjamin Netanyahu came to speak to a joint session of Congress because he has confidence the United States will protect Israel if Iran draws Israel into this war? Of course not. He came to Washington because he fears the opposite: that if Israel must fight Iran, it will likely fight alone. The other troublesome development is that Putin has threatened to use battlefield nuclear weapons to protect both Russia and Russian armed forces, should western powers give substantive military aid to Ukraine. That’s quite a threat. It acknowledges, as clearly as any warning could do, that Putin has deployed Russian forces to eastern Ukraine. He would not need to protect them if they were not fighting there. Moreover, Putin’s threat is consistent with his strategy to this point: take as much territory as you can, with no more force than is required – but be prepared to use as much force as necessary. He knows the fight is right next door. Nations that fight near their borders are not disposed to lose. No one should assume Putin is bluffing. Western nations cannot understand why he would act so aggressively, but they should listen more carefully to the core meaning of his statements during the last year and a half. Russia’s actions confirm what many have observed: Putin regards the Maidan movement that sent Yanukovich back to Russia as a direct attack from NATO and the United States on a Russian client state. From this perspective, Moscow’s move on Crimea was not just an opportunistic grab for some strategic territory. 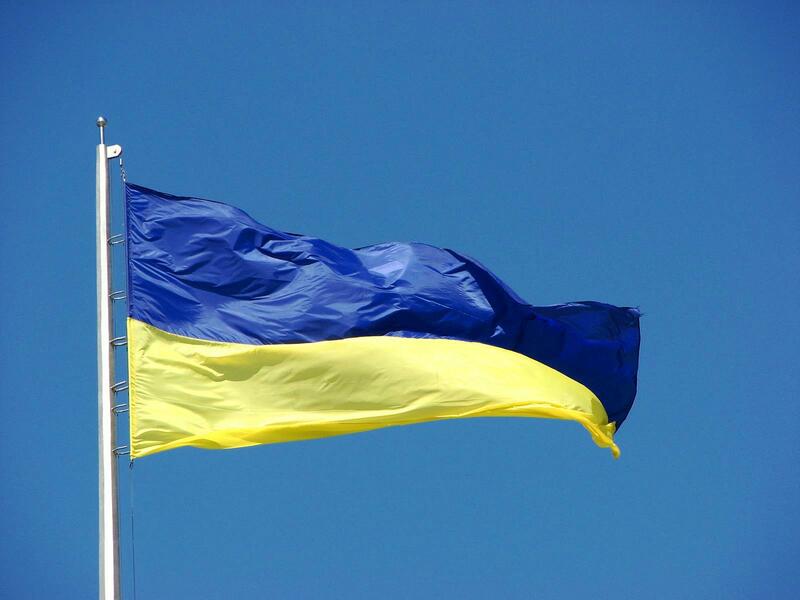 It was rather a first step to limit the damage emanating from Maidan. Putin does not want the EU or NATO present in Kiev, any more than we would want to see the Islamic State initiate operations in Montreal. Let’s come back to Shock and Awe before we close. People who defend our invasion in 2003 say that no one then could predict the world war we see now. Besides, no clear thread of causation links the U. S. invasion to numerous regional and civil wars that developed after 2003. Both statements are true, given what we knew then, and even what we know twelve years later. Nevertheless, many people predicted in 2003 that catastrophe would follow from the U. S. invasion, and the consequences of U. S. military action have in fact been catastrophic. Second, threads of causation may not run in straight lines, but they do form a web. The web of interrelated factors for war has grown apace for twelve years. Numerous conflicts have gradually coalesced – exactly the outcome firefighters fear when they see scattered fires grow into a firestorm on a hot, windy day. Hussein was no peacenik – he caused chronic and deadly trouble for Kurds, Shiites, Kuwaitis, and Iranians. Nothing he did, however, could stir the region, or destroy its political equilibrium, as effectively as the United States could. Hussein’s leadership did not extend beyond Iraq’s Sunni tribes. Everyone else he killed, coerced, or fought. The United States, in a terrible blunder, traded its worldwide leadership for Hussein’s execution, and civil war without end. It had the capacity to destroy everything, including its moral standing and the political order it led. Many hoped for the best on March 19, 2003, when George W. Bush stated our goals in a speech to the country, to “disarm Iraq, to free its people and to defend the world from grave danger.” In so doing, he continued, “we will accept no outcome but victory.” That’s an interesting verb: accept. It suggests that the United States would have primary control over events in Iraq. Pandora learned otherwise; so did the United States. Yes. The situation in the Middle East is probably as bad it’s been in a century since the chaos and genocide of the First World War. It is very bad. But there is always worse, much worse. In the last ten years hundreds of thousands have died, millions have been made refugees. A nuclear war would not stop after the first bomb. Do you think Israel would not strike back with a dozen or two dozen weapons? I don’t think the world can properly imagine the result of _millions_ dead and injured within a few days. Good to see you back, Mike! Your comparison to the Middle East during the First World War is good. One can’t say how many people would die in a Middle Eastern nuclear war. For statistics on misery, better to compare today’s world war with another world war. The general point about nuclear weapons still stands: we fear them so much that we can overlook what is actually happening in front of us. We remember two nuclear weapons that ended World War II, but as many military historians point out, conventional weapons caused a lot more damage. Certainly you are correct regarding World War II. In fact the atomic bombings were not even the most destructive air attacks. In Tokyo on March 9-10 1945 at least 100,000 people and 16 square miles of the city were incinerated in a B-29 raid.